Couple of weeks since we've had a game thanks to a blank week (during which I wrote a lot of cheques and pulled a lot of faces) and a cancellation. Two games left of the 2015/2016 season and I think we're a little like Swansea, hopefully having already done enough to stay up. Bracing duo of Ed and Natalie in for the doubles. 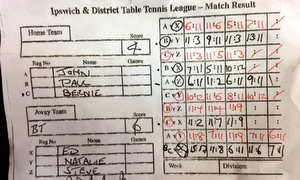 Down to that final end before Natalie put away some nifty backhands to claim that vital point and, in so doing, the win. Division 2!